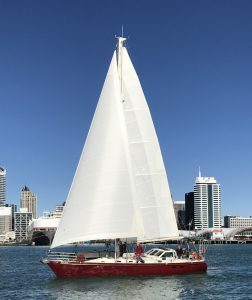 We have done the first 4000 Miles of our 12000 mile voyage from Auckland to Amsterdam, the boat is doing wonderfully and her crew is hanging on in there enjoying the ride. 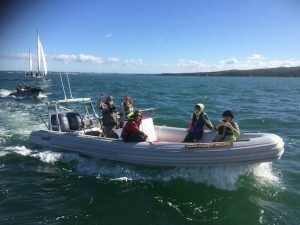 We left Auckland right on schedule on 14 May 2017, and were waved out by a lovely group of friends and family from the wharf and then escorted out of the harbour by a small flotilla of my favourite boats, Vega, Ranui, and 2 GP inflatable’s, I was unaware that this was going to happen, and having on the organising side of one or 2 of those events. I realy appreciated the effort that it took to come out on a Sunday afternoon both on the wharf and on the water just to see us off, it realy touched me. Tiama looked great with her new set of sails and outfitted for a 6 month journey half way around the world, she looked the part. It did seem a bit unreal that we where actually doing this after so many years of talking about it, in some sense I have been preparing the boat for this journey for the last 15 years, but got held back by assumed responsibilities and other things to do, so here we go upwards and onwards, one step of the time. The journey so far brought us for a short stop to the Kermadec islands to drop of a small department of conservation team that came with us from Auckland then to the friendly island, Tonga, this is a place to come back to for further investigation, from we did the longest leg of the trip, Tonga to Hawaii, across the equator where king Neptune Angus the third came onboard for a quick visit. 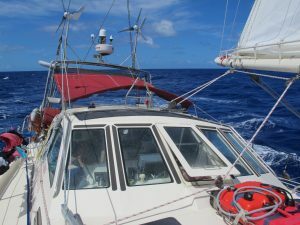 We had to motor across the equator, no wind but otherwise we have mostly sailed, I forgot how uncomfortably hot it gets in the tropics, definitely not my short of weather conditions,. Otherwise not much to tell which is as it should be. 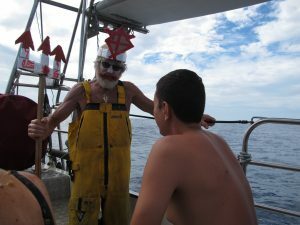 Now a short stop in Honolulu for provisions a cold beer and some fresh crew and onwards we go.